Think you have what it takes to out-hustle, out-work, out-think, out-play and outlast? Let's see if you're good enough to "Meet the Mets!" 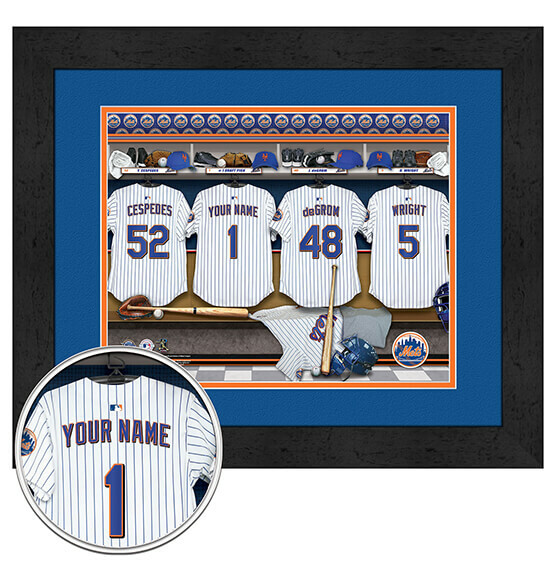 Our New York Mets Personalized MLB Locker Room Framed Wall decor features your name on the back of an iconic Mets jersey. It boasts a digital double mat frame with the Mets' team colors and logo. This high-quality glass, MDF vinyl-wrapped frame and full-color print has a classy look that hangs anywhere: home, office or fan cave. Purchase our custom sports decor for yourself or for any die-hard Mets fan in your life; this framed art is a gift that will be cherished forever! For your convenience, this piece comes ready to hang with a sawtooth hanger for easy mounting.